Windows is the leading Operating by far being used all over the world and the technology and applications and softwares and hardwares improving and increasing day by day it is becoming very complicated to keep your Windows Laptop or Desktop running at full potential all the time. I have heard many users complaining of their laptop of desktop lagging or slowing down and opening after a long time which is becoming quite common with users after a certain period of time. This can be because of too much memory on your Program Files Disk which will decrease its processing power due to lack of space available so make sure that the Disk containing Program files is free and also doesnot contain any Virus or Malware. Even after doing that you are facing the same problem then it must be due to the accumulating Cache files in your System which can be application data, browser data, file explorer data, searches data which are saved by your system to make it easy and faster to retrieve and improve your efficiency on the longer run, but if you are not going to clear the cache data and keep an eye on it, it can accumulate to slow down your Desktop or Laptop considerably. So let me show you How to Clear Data or Cache from your Windows XP or Windows 7 or Windows 8 and 8.1. If you are using windows XP you have to launch RUN program and then type in it “cleanmgr” which will automatically launch the disk cleanup program which will calculate and show you the amount of cache data which is stored. 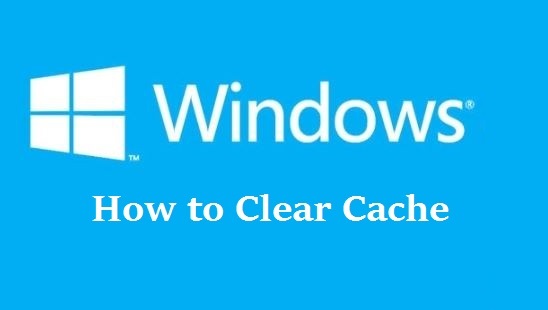 If you are using Windows 7 or 8 or 8.1 then all you have to do is go to Search and type in “cleanmgr” which will launch the application automatically and start calculating the amount of cache and clear it. This is a program which will calculate the amount of cache stored in all your System. Open My Computer and then go to the specific folder or disk which you want to clear your cache from and Right click on and tap or click on Properties from where you have to search for Disk Cleanup and click on it which will calculate the amount of space which can be cleared or freed. Now you can select which files you want to clear out and click OK to clean up all the data which was making your system slow. This can be done only in systems running on Windows 8 or later as Windows Store is only available in these devices. From your desktop Hold the Windows key along with R which will launch Run Application. In this you ahve to enter “WSReset.exe” and press enter. Now a window will appear telling you that The cache for the Store was cleared. This trick can only be possible on Window 8 and later devices as the earlier devices did not have the Tiles option. Go to Start Screen and then Hold Windows button + C together to launch the Settings or Charms bar which will have Settings which should be selected and then Click on Tiles. Now you will see two options you have to select the one at the bottom which is Clear Personal info from my tiles. On doing so you will be clearing cache which was stored by all the applications which are being used as tiles and clearing lot of data to help speed up your laptop or System. Clearing this is pretty easy with the help of a single command from command prompt. This will automatically clear all dns cache from your system and will seriously improve your systems performance many folds. Follow these tips and tricks which will surely help in increasing your PC or Laptops performance many fold as these are the main and most common culprits in slowing down your system or laptop.